“My Thanksgiving for His Giving: A Forty-Day Lenten Devotional of Thanksgiving” from Christian Faith Publishing author Dr. Philip Dunston is an inspiring devotional taking the reader on a forty-day journey in the word of God, reliving the season and thanking God for the tremendous sacrifice that Jesus Christ made on our behalf. Published by Christian Faith Publishing, Dr. Philip Dunston’s new book is a forty-day Lenten devotional, commencing with Ash Wednesday and ending on Easter Eve. The reader takes a forty-day journey in the word of God, reliving the season and thanking God for the tremendous sacrifice that Jesus Christ made on our behalf. The journal highlights the significance of the Lenten season for Christians. Its goal is to remind Christians to be thankful for God’s love, the opportunity to give thanks to God and to share that love with others. View a synopsis of “My Thanksgiving for His Giving: A Forty-Day Lenten Devotional of Thanksgiving” on YouTube. 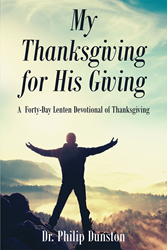 Consumers can purchase “My Thanksgiving for His Giving: A Forty-Day Lenten Devotional of Thanksgiving” at traditional brick & mortar bookstores, or online at Amazon.com, Apple iTunes store, Kobo or Barnes and Noble. For additional information or inquiries about “My Thanksgiving for His Giving: A Forty-Day Lenten Devotional of Thanksgiving”, contact the Christian Faith Publishing media department at 866-554-0919.